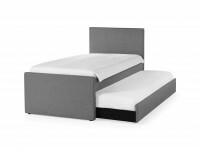 Single, double and king-size divan beds from Warehouse Prestwich. We offer a massive range of divan beds with help both online and on the phone to help you choose the perfect divan bed. Divan bed sets consist of a base and mattress (headboards are not included in the price but are usually available as an optional extra), however mattresses can be purchased separately if required. If you are looking for bedroom furniture and want a mattress to accompany your new divan bed then take a look at our range of mattresses that can help you get a good night's sleep. We have a huge range of sofa beds that can sleep family and friends when they come to stay. Warehouse Prestwich has some of the finest special offers in the UK today, including clearance items on living room furniture and bedroom furniture, as well as discount prices on an array of designs and classic styles for all home furniture. If you would like more information on any of our bedroom furniture including wardrobes, dressing tables, mattresses or beds in Manchester then please contact a member of staff on 0161 773 8625 or email info@thewarehouseprestwich.com. If you cannot find the wooden bed or other bedroom furniture you require then please don’t hesitate to pick up the phone, or take a browse through our website and see what more we have to offer.